Tao means harmony with nature. 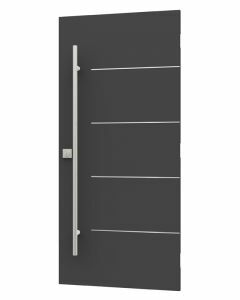 This door’s horizontal lines feature gentle organic curves that add movement to the otherwise smooth surface of the steel. The result is a sophisticated door that is both bold and minimalist – two of the core tenets of contemporary style. 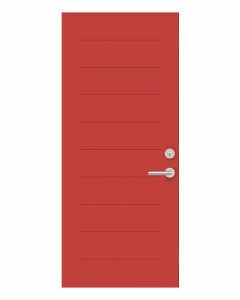 Design tip This door is simple yet stylish. Perfect for designing uniform entrances with a good degree of privacy for townhouses for multiple unit buildings and developments. Maximum non-standard dimensions for custom order : 33 3/4" à 35 3/4" x 70" à 79"
A 20-minute fire rating is available for this product in the N300 and N600 models only (see the "Technical Details" foldout for details), and only on products no smaller than 36" x 80'', with no doorglass. Optional closer and panic door (emergency exit) assemblies are offered on this model. 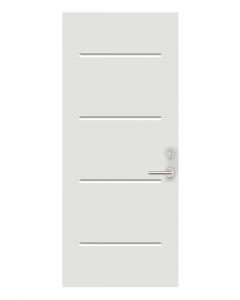 For all warranty details on steel doors, consult «Novatech Warranty - Steel doors».